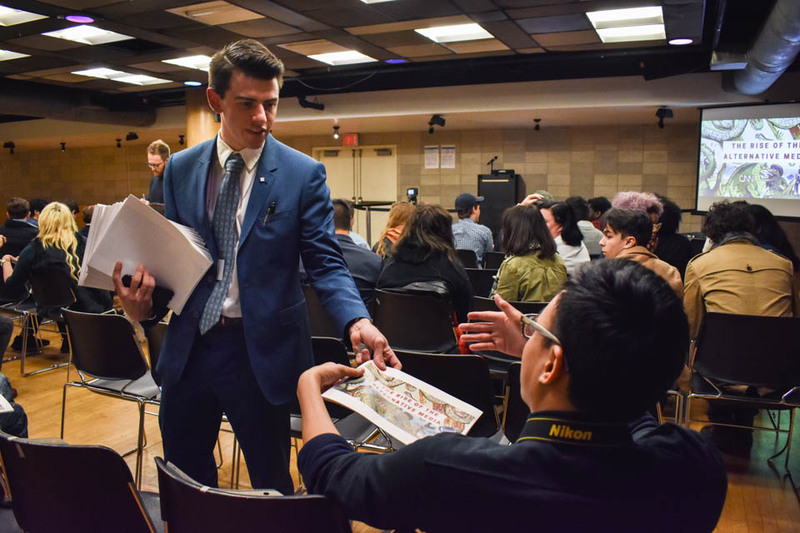 Many claims have been levied against the Columbia University College Republicans recently, mostly surrounding our speaker series this October. We at the very least contend that we possess the right to host these speakers while maintaining our club’s recognition and funding. It is impossible to address every single criticism here, but we will reply to several of the most common objections. Most seriously, critics have alleged that we have brought presenters who threaten the physical safety of our own peers. We ask that someone point to just one specific act of physical violence inspired by a speech hosted specifically by CUCR. If the probability of violence were as great as our critics allege, surely some violent act would have occurred between the two different events. Furthermore, even if a speaker has incited real physical violence in the past, if we use Brandenburg v. Ohio as our standard, the speech at Columbia itself must be proven to be “directed to inciting or producing imminent lawless action” and “likely to incite or produce such action.” Critics have cited no such disqualifying examples in our events. The problem remains: Feelings are intrinsically subjective experiences. How should we objectively measure each student’s feelings? How would we consistently enforce this right? What is to prevent someone from simply saying that any given speaker’s talk is dehumanizing, and how could you necessarily prove your case any different from mine? We do not deny the feeling of dehumanization. Asking this question is not meant to be cheeky, but to demonstrate the limits to the practical enforcement of the proposed “right to feel like a human” and how it may affect other rights, like freedom of speech. The fundamental nature of a punishable offense is that we can point to the weapon, we can point the aggressor, and most importantly, we can point to the resulting bruises. But if dehumanization consists of something that is a subjective experience, anyone has the right to a heckler’s veto by virtue of their capacity to feel. We do not deny that there are costs to speech—painful costs, even. This is a perfectly legitimate argument against whether we should bring a speaker. But can we ban particular speakers because the subjective costs supposedly outweigh the subjective benefits? This is a necessarily arbitrary determination. The only way to avoid the nefarious abuse of censorship is a hard and fast rule: Groups may make their own determinations pertaining to weighing the costs and benefits of bringing speakers to campus, so long as objectively measurable violence does not result. Groups should not have to justify their specific speaker choices to any authority, because the extant moral ambiguity would thus permit the rejection of any speaker that authority dislikes. The University can either allow us to operate as one of the very few right-of-center student organizations as we see fit, or it can be perhaps the only American university without a Republican organization. There is no in-between. Many at the CCSC meeting echoed a popular sentiment: Even if the community recognizes CUCR, it should not have to fund security costs for provocateurs that we all know will cause a stir. The problem is, the reaction to an idea does not necessarily reflect the quality of that idea. If we judged the merits of speech on the basis of the reaction to said speech, anyone who could gather a raucous enough crowd could thwart any speech, however benign, of which the mob disapproved. When white supremacists threatened Ruby Bridges as she entered the first integrated school in the New Orleans, it required enlisting federal marshals to keep Bridges safe. Surely we would not have listened to those bigots if they objected to having to cover the security costs from the threat of those very bigots. The best way to ensure the protection of the exercise of all rights, including Ruby Bridges’ right to go to school, is to never refuse protection on the basis of costs. Later at the CCSC hearing concerning our club, we invoked the time Columbia hosted then-Iranian President Mahmoud Ahmadinejad to demonstrate the extent of free speech; we said both Ahmadinejad and Cernovich wield great influence in the world. To this, it has often been replied something along the lines of, “But that was different—Ahmadinejad was an elected leader.” Badran, for instance, distinguished between “One’s ability to gain followers on Twitter or share their incoherent and illogical talk“ and “a legitimate political actor whose words are worthy of the stage offered to them.” Now, we would hardly call the leader of a theocracy legitimate. But let us put that aside. By this logic, Donald Trump would constitute “a legitimate political actor.” Or, what if Mike Cernovich were elected mayor of Springfield, Nebraska? Somehow, we anticipate few critics suddenly tolerating these speeches. While Columbia’s obligation to the law, by virtue of its receiving many millions of dollars of federal and state funding, is disputed, no place more crucially determines the intellectual character of our nation than the halls of its greatest universities. If colleges abandon freedom of speech, the country may soon follow. To conclude, we see an irreconcilable paradox in the logic of those who, in the name of protecting marginalized students, call for the censorship of hate speech. After all, who is to enforce the proposed speech codes but Columbia University and the local, state, and federal governments of the United States? And yet, these institutions are the very same actors that ostensibly marginalize the students in need of protection. So why would we afford such authority more power with which to even further marginalize people? It is this point that we hope to make. Freedom of speech is not just for CUCR. Upholding freedom of speech faithfully and robustly for all, no matter how apparently vile, is the only way to ensure that concentrated power is not then wielded against the most vulnerable members of society. CUCR is the largest right-of-center student organization at Columbia. It hosts speakers and open general body meetings on Tuesday nights.